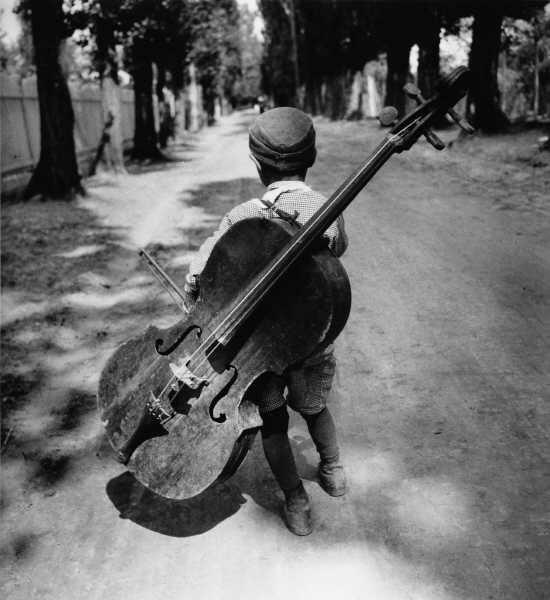 Roma boy with bass, Balaton, Hungary, 1931. Gelatin silver print, format 30,5×28,5cm, signed in pencil on the reverse, 1931, printed later by masterprinter Michael Windig (De Verbeelding), framed in black wooden frame with museumglass. Available an edition of 2. 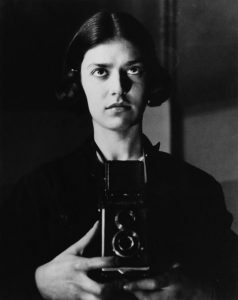 Eva Besnyö (1910-2003) is born in Budapest. At the age of fifteen she gets a Kodak Brownie. After the grammar school Eva follows a training with the then well-known photographer Jozsef Pecsi. From her father she gets a Rolleiflex camera with negatives of 6×6 cm. With this type of camera she will continue to work until 1969. In 1930 she leaves for Berlin and meets her later husband John Fernhout. Through him she is included in the circle around the painter Charley Toorop. 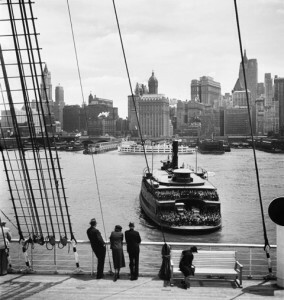 In the thirties she photographs a lot of architecture in commission. Because of increasing anti-Semitism, it is difficult for Eva to remain active as a Jewish photographer in Berlin. After a holiday in Hungary she moves to the Netherlands in the autumn. At the Lake Balaton in Hungary she makes her famous photo of a boy with bass. After the war she shifted her field to documentary series. In the seventies Besnyö was intensively involved in the ‘Dolle Mina’ (women’s lib) movement, which she also recorded extensively. 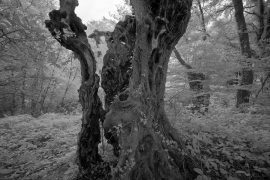 In her later life she receives many prestigious prizes, including the Dr. Erich Salomon award in Berlin and, together with Paul Huf, set up the Photography Museum Amsterdam Foundation (FOAM). Exhibitions: Budapest-Berlin-Amsterdam, Photographien 1930-1989, Berlinischen Galerie (Landesmuseum für Moderne Kunst), 28 October 2011-27 February 2012), Berlin; Fotografie und Architektur, Jeu de Paume: The Sensuous Image, from 22 May 2012 until 23 September 2012, Paris; Budapest-Berlin-Amsterdam, Käthe Kollwitz Museum, 21 September- 9 December 2018, Cologne (Germany).